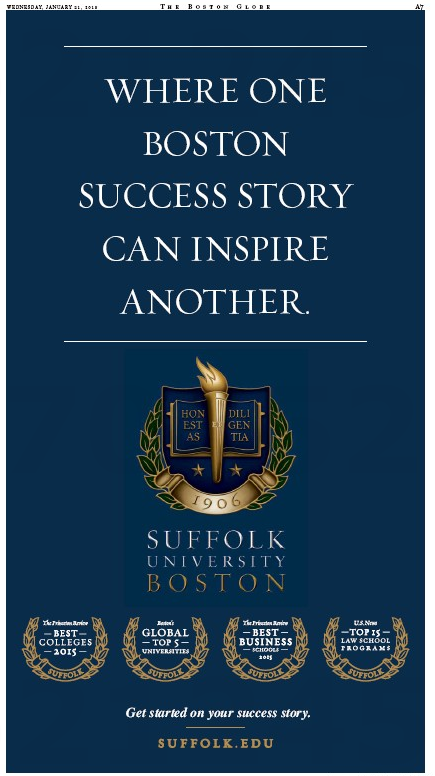 University to Boston Herald: Suffolk You! As the hardreading staff has dutifully chronicled, the Boston Herald has been a satellite campus of Suffolk University for years now, including – but not limited to – their joint Press Party Wayne’s World webcast, their Race for Governor tag-teaming of the 2014 Massachusetts gubernatorial election, their Inside the Race for Mayor for the 2013 Boston mayoral race, the John Nucci Connection (sounds like a ’60s British Invasion band, no? ), and etc. So imagine our surprise when this ad turned up not in the bestie local tabloid, but in the Boston Globe. Inspire that, Heraldniks. Right where it hurts. Some success story . . . This entry was posted on Wednesday, January 21st, 2015 at 12:12 pm and is filed under Uncategorized. You can follow any responses to this entry through the RSS 2.0 feed. You can leave a response, or trackback from your own site.